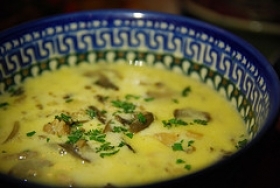 Have you made Casablanca Cafe Cream Of Mushroom And Wild Rice Soup? 1. Melt 4 tablespoons butter in large saucepan over low heat. 2. Add flour and cook 3 minutes, stirring constantly. 3. Slowly stir in hot milk and 1 cup stock. 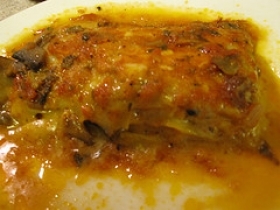 Cook sauce over low heat, stirring constantly with wooden spoon, until smooth, about 15 minutes. 4. In another saucepan, melt 1 tablespoon of remaining butter. 5. Add 1/4 cup onion, the paprika and 1/8 teaspoon nutmeg and cook 2 minutes. 6. Add to first mixture and stir to combine. In same pan, saute 2 cups sliced mushrooms in remaining 2 tablespoons butter. 7. 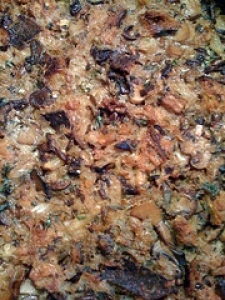 Add bay leaf, remaining 1/4 cup sliced onion, the chopped celery, cloves and remaining 1 cup stock. 8. Cover and cook medium heat 10 minutes. Blend mixture in blender or food processor until smooth, about 1 minute. 9. 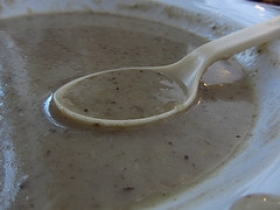 Strain both the mushroom/celery mixture through a fine sieve and the flour/milk mixture through a colander. 10. Discard vegetable pieces. Return both mixtures to large saucepan and combine. 11. Cook 5 minutes over low heat, stirring until mixture is smooth. 12. 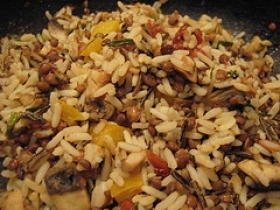 Stir in rice, remaining 1 cup sliced mushrooms, parsley and wine. 13. Add salt and pepper, if desired. Remove bay leaf, sprinkle with reserved nutmeg if desired, and serve. 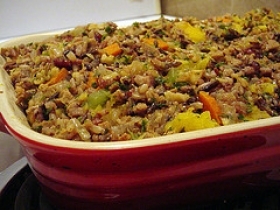 This recipe contains potential food allergens and will effect people with Wheat, Milk, Butter, Gluten, Mushroom, Rice, Sulfites, Celery, Onion allergies.